If you need an office chair made to improve your posture, go for a neutral posture ergonomic executive chair. Ergonomic chairs in the office help make for a healthier workforce. Posture ergonomic chairs are made help users emulate the free-floating experience of the neutral body posture. Neutral body posture is when the body is at its most stress-free, long-term posture and ideal balance of weight for its muscles, tendons and ligaments. Posture chairs in the office will completely support users’ body postures without putting any undue pressure on the user bodies. It’s similar to a cloud floating. Need posture ergonomic chairs today? 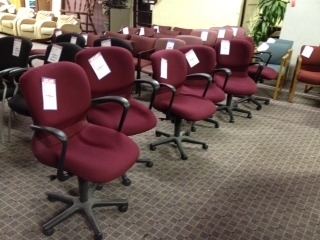 If yes, purchase some Used Brylee Deluxe Posture Executive Chairs from Markdowns Office Furniture at an affordable price. This entry was posted on Friday, October 5th, 2012 at 4:13 pm. Both comments and pings are currently closed.